The following is the text of an IBM Data Processing Division press release distributed on July 1, 1968. Formal acceptance of two, new super-speed computers -- IBM System/360 Model 95s - - by NASA's Goddard Space Flight Center was announced here (Washington, D.C.) today by International Business Machines Corporation. The two computers are the first and only ones in IBM's Model 90 series equipped with ultra-high-speed thin-film memories. Over a million characters (bytes) of information are stored in each on magnetic "spots" four millionths of an inch thick. With an access time of 67 nanoseconds (billionths of a second), these are the fastest, large-scale memories in user operation. 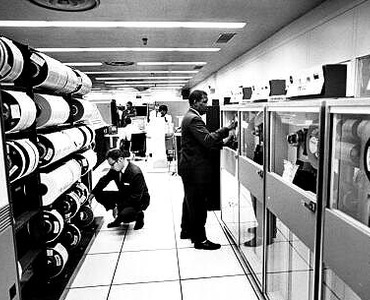 Both of NASA's Model 95s are handling space exploration problems which require unusually high computation speeds. The Model 95s are capable of computing 14-digit multiplications at a rate of over 330-million in a minute. One Model 95 is the primary data processing facility for the Center's Tracking and Data Systems Directorate. It provides additional computing support to the Project, Technology and Systems Reliability Directorates. The second Model 95 is being used by astrophysicists at NASA to create massive mathematical models of the universe. The boost in computing capability is enabling them to simulate the evolution of galaxies, stars and planets to a degree never before possible. The speed of the thin-film memories gives the Model 95s a performance edge -- up to twice as fast on certain problems - - over the Model 91, which was the first super-speed computer in the Model 90 series. IBM's initial Model 91 was placed in operation earlier this year by NASA-Goddard. These memory units, developed and manufactured at IBM's Components Division facility at Burlington, Vermont, utilize advanced array and circuit technology to achieve high speed. The magnetic storage element consists of a very thin nickel-iron-cobalt film which is vacuum-deposited on a copper plate. The storage elements are driven and sensed by means of thin copper strip lines. New circuit and packaging techniques are used with the unique memory array to achieve the fast - - 120 nanoseconds - - cycle time. Each Model 95 is equipped with 16 thin-film memory units. The data width, at which information is transferred to the processor, is eight bytes. In addition to the thin-film memory, the Model 95 has a 4-million character core memory. The core memory has a cycle time of 750 nanoseconds. The memory combination gives the Model 95 five-million-plus character main storage system -- more than twice the storage capacity of the Model 91. The Model 95 has auxiliary storage of about one billion alphanumeric characters. It consists of disk, drum and data cell devices. With five high speed printers, it can generate up to 5,500 lines of information a minute. The Model 90 series was initiated by IBM as a program to advance the state of computer art and to serve a limited number of sophisticated data processing users. With its program objectives met and all deliveries now scheduled over the next 12 months, IBM has stopped accepting orders for these computers.